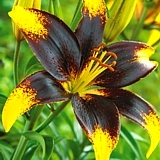 This amazing rich gold and maroon bicolour Lily is called "Lionheart". 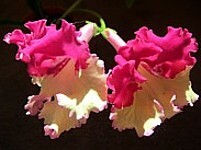 The essence made from it (minus the anthers) overcomes apathy and fear, and fills one with the desire for action. It instils courage and strength of mind to face up to and deal with unpleasant or difficult problems. First sit calmly in meditation for a while after taking around nine drops of the Lionheart essence under the tongue or in water. This essence overcomes emotionally charged muddle-headedness. It links one with the "Higher self" to bring clarity of mind, wisdom, diplomacy and common sense, when considering all the options open to one in dealing with a problem at the current time. During meditation personal spirit guides can also be asked to offer their wisdom, especially where a decision must be made, and continuing to ignore a problem will not make it make it disappear. Links to third eye, solar plexus and base chakras, adrenaline. The flowers for this Royal Poinciana essence were discovered in Los Cristianos in Tenerife, where the flower-covered trees provide a warm welcome to visitors with their coral-coloured, orchid-like blooms. Royal Poinciana essence helps you to attain your goals by offering clarity, focus, conviction, fearlessness and belief in yourself. It nurtures and provides emotional support when times are hard, and helps you to "hang in there" after setbacks, or when there are high demands on your time. Whilst it helps you to be bold, take on challenging projects and reach for the stars, it also assists with boundary setting, and it dispels uncertainty, lack of motivation, timidity and lack of self-worth. I suspect that when this beautiful exotic Streptocarpus flowered for the first time, all the grower could say was "Wow" - so that is what it came to be called. "Wow" essence encourages appreciation and gratitude for what one has in terms of family, relationships, a home, a job, pets, worldly goods and finance etc. It encourages us to take a light-hearted look around and marvel at the beauty in our environment, instead of focussing on the negative aspects of it. It also neutralises the constant nagging desire to "keep up with the Joneses" by buying the latest fashions, a new car, household goods etc. that are continually advertised on TV or in magazines.